In need of some birthday gifts, I decided to make some mug rugs. I have not made these yet. My first foray into the craze that hit the quilting world this past year. I've read that they can be very addicting to make and now I can see why. What a wonderful use for scraps. Theme possibilities are endless. Top it off with a matching mug and you have a cute present. You can add a small bag of tea or coffee or put a gift card in the mug. Very fun! What a wonderful idea, love your one, would make perfect christmas gifts!!! I love this idea!!! I have two set of these that a friend made me. Awesome gift. So very cute Renee. Love the colors. I've not tried making these yet. I could practice and showcase little bits of quilting. Did you use batting or flannel inside; and, if batting, what kind worked best. Renée, I *love* your choice of fabrics. Just looking at them will bring a bit of tranquility to the recipients. Beautiful job. What a good idea, a smaller project that might actually get finished. Thanks for visiting and reading my latest post. I don't know why you can't send emails, I would love to hear from you. How about this, just email me through the comment form and I will of course not post the email to the blog. That way we can keep in touch. I would love that. Now I think I might go down to my sewing room and do a bit of quilting. It is long overdue. And you know what, I don't have any coasters and always grab a paper towel or napkin to put under drinks on the table. Duh, why didn't I think of the quilted coaster? Have a great weekend. Those are so cute. Last year I said I was going to make a mug rug for Christmas for every woman in my life...zero made 30 to go! You are so right they are very addicting. I love the stitching you did on yours. 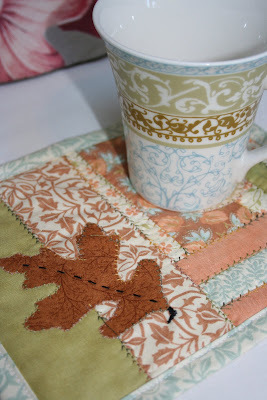 I'm loving these mug rugs and the pretty fabrics you used too. I'm gonna have to make me some and quit just saying that! Another thing to add to the list, but I love that you can make use of scraps. That is a great gift! Love how you matched it. 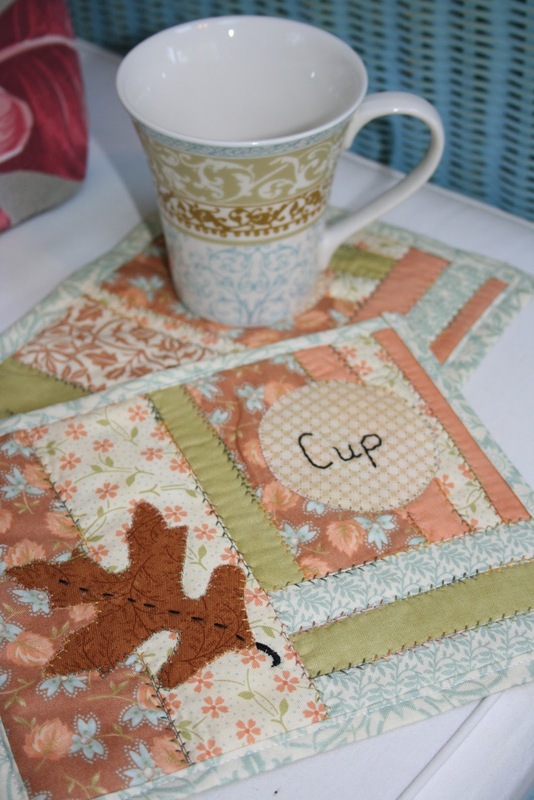 Your mug rugs turned out too cute! They have been on my long list of fun things to try! That's a lovely idea - and so pretty to match the mug. Thanks for your welcome message too. Blessings!